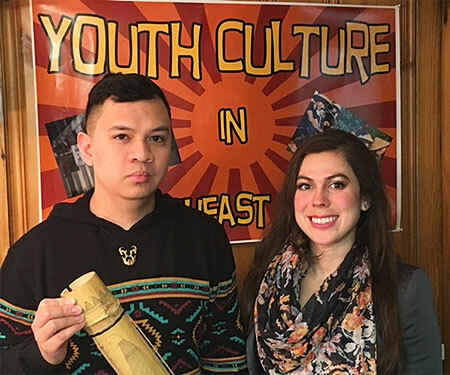 Smithsonian summer: NIU students to explore anthropology in D.C.
NIU students Anthonie Tumpag and Shannon Thomas are off to participate in the Smithsonian Summer Institute in Museum Anthropology (SIMA) at the Smithsonian Institution’s National Museum of Natural History. SIMA is a rigorous four-week training program in residence at the Smithsonian in Washington, D.C. The curriculum will combine formal classroom, lecture and laboratory sessions, as well as structured time for individual data collection and meetings with relevant subject matter specialists. Regular homework involving assigned readings as well as periodic written revisions to the initial project proposal are part of the experience. Visiting professors this year are Ira Jacknis, David Odo and Marit Munson. Major costs of this program are covered by support from the Smithsonian Department of Anthropology and the National Science Foundation. Tumpag is in his final year as a graduate student in cultural anthropology with a concentration in Southeast Asian studies and graduate certificates in applied anthropology and art history. He hopes to study the Smithsonian’s collections from across maritime Southeast Asia, Madagascar and Oceania to explore these people’s shared ancestry through an anthropological lens. He hopes an analysis of the similarities and differences in particular material and intangible culture will illuminate the peoples’ connections to one another. He also hopes to contribute to the notion that such material culture is not stoic or frozen in time by highlighting their dynamic nature throughout history. They can serve an enduring role particularly with indigenous and colonized peoples associated with museum collections who wish to reconnect with their ancestral identities. Prior to beginning SIMA training, he conducted research in Madagascar and Indonesia as well as participated in an intensive language immersion program in Indonesia funded by a Fulbright-Hays fellowship. Thomas is a second-year graduate student in cultural anthropology with an emphasis on Southeast Asian studies. Her work at the Smithsonian will explore the relationship between culture and the natural environment of the indigenous Filipino Ifugao group. In her research, she strives to create a clear understanding of human interaction with natural resources and the ways that marginalized people are negatively impacted by environmental degradation. Additionally, she plans to explore the role of the environment within the culture of the Ifugao people in order to advocate for the preservation of cultural integrity. Her stint at the Smithsonian will serve as a precursor before she leaves for the Philippines to conduct a nine-month Fulbright fellowship on the indigenous Filipino Tagbanua on the island of Palawan. Anthonie TumpagAnthropologycultural anthropologyDepartment of AnthropologyLaurence Anthonie TumpagNational Museum of Natural HistoryNIU AnthropologyShannon ThomasSmithsonian Department of AnthropologySmithsonian InstitutionSmithsonian Summer Institute in Museum AnthropologySoutheast Asian Studiesstudent career successWashington D.C.